Mississippi is quite poor. In both equivalized and per capita income, Mississippi is in last or second-to-last place for every ventile except the 5th percentile in equivalized income where it is in third-to-last place. New Hampshire outperforms everywhere except the top. In both equivalized and per capita income, New Hampshire is ranked number one at every ventile until you get to the 70th or 75th percentile, at which point it gives way to New Jersey and Connecticut. Even at the higher percentiles, however, New Hampshire remains in the top 5 or 6 states. Vermont is the most equal. In both equivalized and per capita income, Vermont has the lowest P90/P10 ratio, the second-to-lowest P90/P50 ratio (behind Minnesota), and the lowest P50/P10 ratio. New Mexico is the least equal? In equivalized income, New Mexico has the highest P90/P10 ratio, the highest P90/P50 ratio, and the second-to-highest P50/P10 ratio (behind Arkansas). In per capita income, New Mexico has the highest P90/P10 ratio, the highest P90/P50 ratio, and the fourth-to-highest P50/P10 ratio (behind Mississippi, Louisiana, and Oklahoma in that order). Capitalism’s emphasis on property rights has been historically fraught with peril since its inception as an economic force in the Western world. Capitalism is an economic system in which assets are privately owned and commodities and services are produced for profit in an otherwise global and competitive market place. But, as seen when the many bloody European revolutions transpired during the fall of feudalism, capitalism has routinely placed property rights over human rights. American roots in capitalism run deep, beginning early during the Transatlantic slave trade when Africans were brought to the eastern shores of what is now North America. Stolen from their native lands and placed in chains for the voyage to America, Africans were exploited for their labor power, leaving their status among the ranks of humans to be determined by elite white men. Slavery built up the economic engine that propelled American capitalism, creating enormous wealth for white elites on the backs of Blacks. The history of African Americans and other race-based conflicts provided a blueprint for further economic-based exploits that stratified people on the basis of social class position, further advancing economic class divisions by deepening the gulf between the haves and have nots. Class matters because it provides individuals with access to society’s most valued resources like good paying jobs, stability and other financial rewards. The higher the class position the more resources afforded for individuals and families. But not all people benefit equally and few actually move up in social class position in life, as we uncritically tend to believe. People of color and women disproportionately make up the bulk of the working class and working poor who are generally invisible and out of sight from the daily happenings of the shrinking middle class. Given our past development in maintaining cheap labor such as the utilization of “sweat shops” by our nation’s major corporations, the mounting pressure of increasing inflation and economic instability have cause the working class to take matters into their own hands. Fast food workers in 60 cities walked off their jobs en masse recently, protesting the economic injustice they have long endured before a greedy restaurant empire. The fast food industry has long exploited the working class for cheap labor, maintaining a protracted policy of low wages that only benefits corporate elites. Currently, the minimum wage of $7.75 per hour is on the edge of the poverty line for an individual and certainly cannot support a family of four. The reluctance on the part of the government (Department of Labor) to mandate steady increases has contributed, in part, to the wage disparities currently under scrutiny. There is much evidence to show that paying living wages to sustain life above poverty is good for society and makes good business sense. 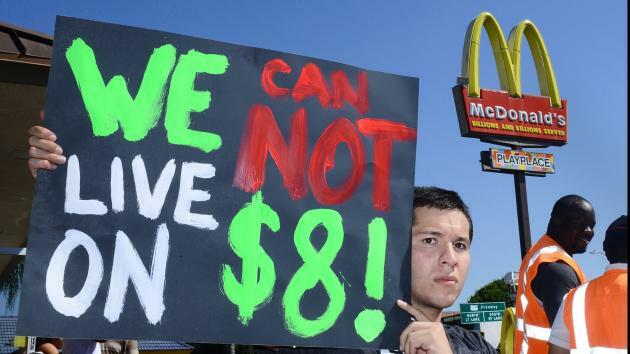 The meager wages that fast food workers are paid in the United States compared to other parts of the Western world reveals much about where our national interests lie and the degree of pro-government involvement with the corporate world. This relationship has allowed many US corporations to flourish, at times creating extraordinary profits even during economic downturn. But capitalism comes at a high price for the oppressed, usually at the at the expense of the poor and disadvantaged. In this case, the proletariat is primarily women with children, who make up the bulk of low-wage fast food workers. This sort of labor requires no formal education and generally attracts people from the fringes of society who are trying to maintain a good living in our downwardly mobile economy. Many Western European democracies consider the United States an unequal and stratified society, historically divided around skin tone, religious persuasion, sexuality, wealth and income inequality. Capitalism deepens this suffering as the very idea of a system designed to allow great economic success for one must come at the expense of another. This history is now being met with contemporary appeals by a growing economically disenfranchised populace who are left to fend for themselves in a class-based society where there is more rhetoric over the ability to move up the ladder than research actually shows. The degree of American discontent over the uncertainty of the economy and the class-based society that defines us as a nation, divided not only by race but by social class position, is our legacy to bear and hopefully undue as it is a matter of public policy for the common good. Like other forms of white-imposed oppression, class-based injustice presents a growing threat to our national security, image and standing in the world as well as our well being as a nation. But it does not have to be this way. American understandings of work, which has notoriously placed property at the center of analysis, can reverse course by beginning to legislate and implement sound policies. To improve our society, these policies must include greater attention to wages and benefits that have the potential to economically empower its most valuable commodity, its citizens.